“Why don’t you start a blog?” suggested my friend Jenna whilst thinking how I could advertise my shop on folksy. To be honest I still don’t know how and a few months down the line I still have the same worries. My written English isn’t the best of standard, my grammar is not something to write to my school English teacher raving about and I have a tendency to whittle on probably losing the interest of anyone who has decided to read this blog. Not to mention the worry of will anyone actually be interested in this? However despite all that I’m giving it a go! My reasons for venturing into the blog o sphere are mixed. 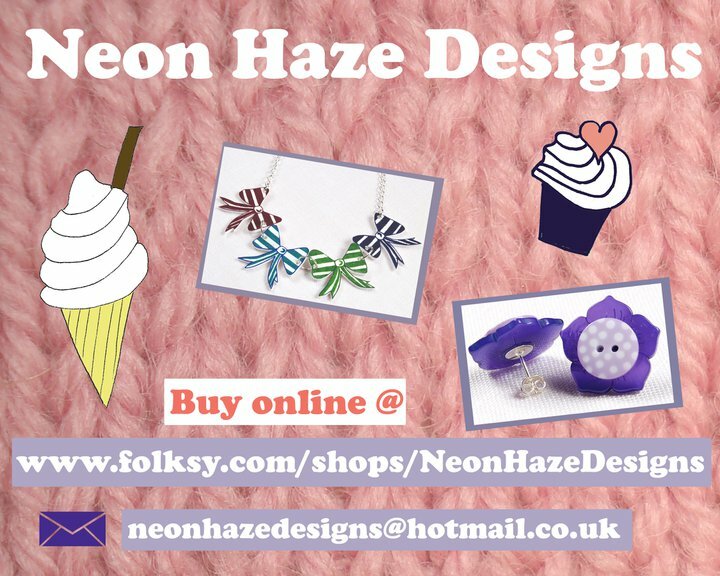 My initial reason was to use this as a way to promote my folksy shop which I launched end of Oct 2010. http://www.folksy.com/shops/NeonHazeDesigns is my shop which sells at the moment a variety of unique and different jewellery I have designed and made. Don’t get me wrong this is still very much up there but the reason has developed. I am a crafter and I love to make things, I love the fact that crafts are more popular than ever so much so that even prime time tv are talking about it, thank you Kirstie Allsopp! And it’s really Kirstie that has helped me realise that I too want to embrace the idea of a home made home and this is where I’m going to document my creations and discoveries! 2011 will see some exciting times ahead as me and my partner (that sounds far too old! ), me and my boyfriend David will be buying our first house (or that’s the plan!) And you know what that means? It means a blank canvas and a chance to make a real home made home! Endless years renting has not been the same, you can never quite get the house to be how you want it, not being yours and all! I hope many happy months will be had making cushions and other odds and ends for the new, yet to be discovered house! I can’t promise to blog ever day or every week but I’ll give it my best shot and at the very least you can always enjoy the photographs. So goodbye for now and welcome aboard the ship Camilla, we shall set sail together very soon! Ahoy! Neon Haze Designs - Link to my shop! As for advertising Folksy and getting more followers here are 2 little hints. One: Folksy Friday is a big thing for bloggers. Pick a theme each week and then find products on Folksy with that theme post them on your blog and let the sellers know you have featured them ( a bit like my Treat Yourself Tuesday ) and Two: Have regular giveaways to attract more followers and advertise your giveaway on Twitter and Facebook (and of course you could mention it in your shop) If you're not on Twitter then maybe give it a go. It is quite easy to build up followers on there that hopefully will bring more people to your blog and you have a retweet (RT) feature so people can RT your post about your giveaway to their friends and so the potential followers grows and grows. Also I have a facebook fan page which are getting very popular see mine here ... http://www.facebook.com/pages/Rainbow-Cottage/242213345227 they are also very easy to set up. However word of warning all this can be very time consuming as you need to be posting regularly to keep people coming back and you need to follow in the hop of being followed. Sorry long comment but I hope helpful. Let me know if I can help at all.